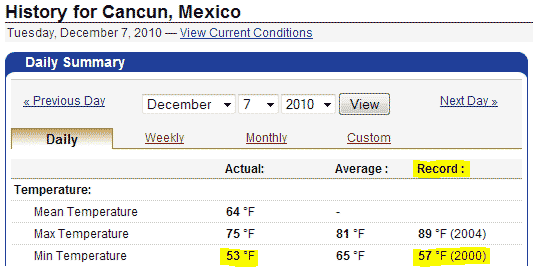 As if ClimateGate wasn’t bad enough, the climate politicos in Cancun are amidst record cold temperatures. The Gore Effect, of course, is the inconvenient coincidence that when Al Gore attends a conference to give a climate speech, cold spells and freak snow storms attend. He is not even there this time. Global temperatures seem to have flatlined over the past decade, despite increases in Co2. The Cancun conference has little hope of changing the political climate, which is decidedly chilling against the concept of hampering economic growth to limit Co2 emissions. 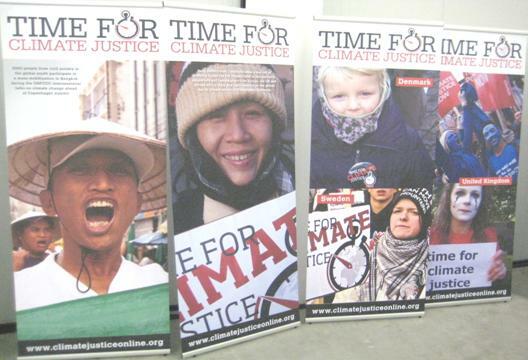 Instead it seems to be devolving into demands by the third-world for “climate justice” – meaning transfer payments from the developed world. See picture below. While the climate parade marches into irrelevance, we do see progress on solving real problems, particularly rotating the fleet from oil to electricity. The electric car momentum continues, with Tesla Motor’s (TSLA) stock remaining buoyant and expectations for the Chevy Volt still high. You’re quite the scientific idiot to not realize that increased temperatures are the cause of temperature VARIATIONS. Increased temperatures cause increase precipitation, increased rainfall, cloud cover and even snowfall. This is why there is massive flooding, huge snowstorms and even temperature drops in unusual places. Record colds WILL happen as a result of increased global temperatures and is in fact, expected by all credible sources. Global temperatures have not flatlined as you claim, just the exact opposite is true, they have continued to increase as shown by NOAA and many other credible sources. Unlike yourself, they have scientific data to back this up. Cherry picking a single date is absolutely absurd and shows just how unbelievably ignorant you are. Or how about the rallying call of the Climate leaders: “Hide the Decline!! !” and we’re idiots? It’s always entertaining to watch the contortions of the Warmists as they try to wriggle out of the obvious implications of actual weather phenomena – so inconveniently contrary to the solemn predictions of Man Made Global Warming. The prediction was not that increased CO2 levels would cause greater variation, but rather that the baseline temperatures would rise dramatically everywhere. It simply hasn’t happened. Global average temps have not increased at all since 1998. Normal scientists, when confronted with the failure of a model, discard the model. The Warmists are too invested in their fable to do that here. It is hilarious to watch Warm-mongers like “Reader” above call everyone who challenges this nonsense “idiots” while he proceeds to demonstrate how much more deserving of that description he himself is. They don’t even understand their own theory and make things up on the fly. The “hypothesis” (it doesn’t deserve to be called a theory) claims that human-generated GHGs will cause a catastrophic build up of latent heat in the bio-system with all manners of dire outcomes. They can never find where this “heat” is accumulating so they either posit that it is hidden in the deep ocean beyond detection, or they try to evade their own claim of warming by saying the build up of GHGs causes “climate disruptions” rather than warming. Anyone wishing to learn the “man-man global warming” zealots’ true objective should download a copy of the IGPCC Copenhagen draft protocol,with special attention to Annex Five, dealing with obligations of “developed nations” (read U.S.) to the “developing nations” (i.e. the backward, corrupt and chronically inept Third World. The Developed Nations are to be required to provide “financial and technical assistance” to the Developing Nations, who in turn are to use the aid – now get this! – primarily to alleviate poverty and secondarily, at their discretion, to reduce greenhouse gas emissions. Does this sound like redistribution of wealth to you? Another question the Greenies and their MSM cheerleaders refuse to ask: “Is global warming necessarily bad?” The East Anglia scammers recognized that exploration of the topic would not advance their agenda when one of them e-mailed another suggesting “We’ve got to get rid of the Medieval Warming.” They know, being scholars, that the period from about 900 A.D. to the early 1300’s to which the term refers was one of great advances in civilization: agriculture, commerce, exploration, the arts and population growth. It was the end of the Dark Ages through the beginning of the Renaissance. And finally, “Why is CO2 bad?” Another topic of non-discussion. Aside from the fact that perhaps the greatest source of carbon dioxide is mammalian respiration, shouldn’t it be noted that CO2 is the basis of photosynthesis, without which animal life on earth would not exist? I will believe the “Sky Is Falling” global warming fearmongers are serious about “carbon footprint”, when I see legislation outlawing restaurant Soda Machines. all i can do is smile. supposed scientists who torture the stats to get the results/interpretations they want. GOD on the other hand, has a keen sense of irony and a whopping good sense of humor. He continues to point out the folly of these so called experts. i, for one, LOVE IT!! keep on talking. the more you talk the more you are proven in error. The best part of it is how the “global warming” crowd guessed the completely wrong direction, and now that we’re seeing lower temperatures, those same people say they were correct about “global climate change”. Shameless. Bad science, on behalf of a hopeless cause. There will be a time when investing in alternative energy is profitable, but energy prices will have to rise substantially, may take 2+ years.